On May 10th, UWFK traveled to Orlando to meet staff and volunteers from other United Ways, talk about best practices, and share key learnings. More than a thousand United Way affiliates from all over the world attended the conference in Orlando, FL. 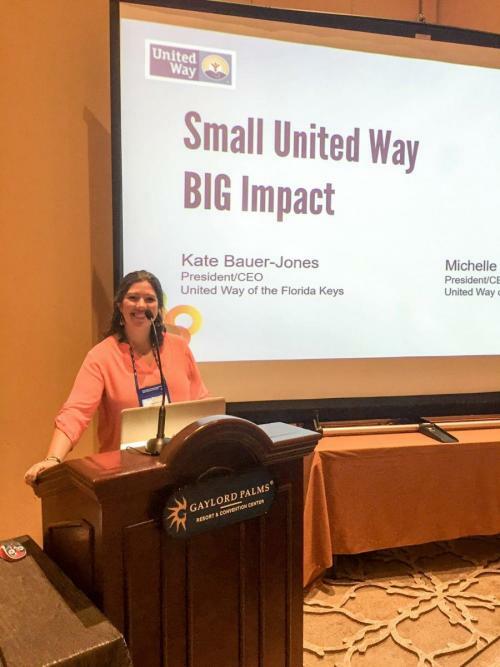 Kate Bauer-Jones, UWFK President / CEO, presented a workshop, “Small United Way: BIG Impact." This workshop focused on how to strengthen and grow smaller budget United Ways by increasing their direct service work. She talked through UWFK’s impact work over the past two years—including our launching of an Imagination Library program, a VITA tax preparation program, and a summer literacy kit program—and how this has helped us brand ourselves, increase community knowledge of our organization, and grow revenue. UWFK is extremely thankful to have had an opportunity to meet others in our United Way network and learn from the work they do!